For the second time this week I went with the navy sportcoat. It's too easy to throw on almost any dress shirt, necktie and trousers and just add the navy coat. Almost. Today's conglomeration starts out with a blue striped, straight collar pinpoint oxford dress shirt as the base. 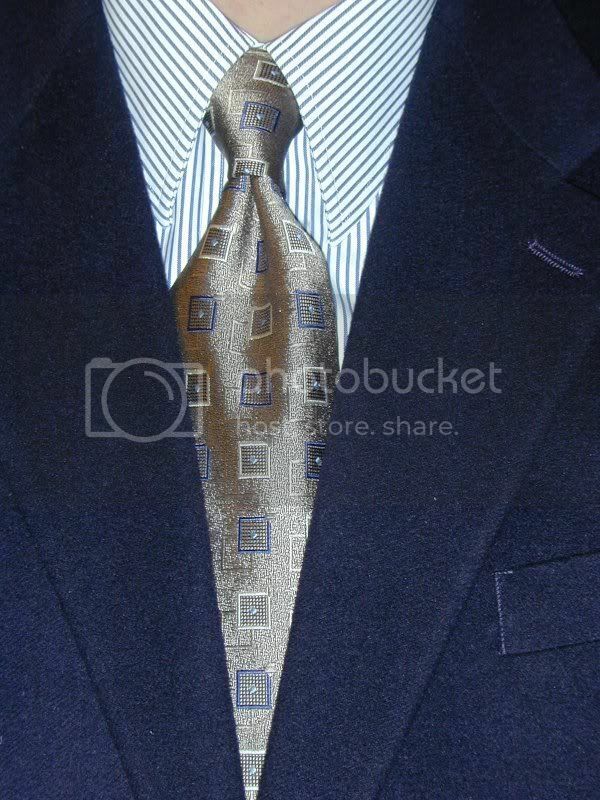 The necktie is another JoS A Bank Signature collection. It's a kind of brownish color (taupe?) background with navy and tan big squares and light blue small squares. Another Ebay purchase as well and a four-in-hand yet again. Never fear, I'll make sure I wear some other knot next week. That's it for a Friday. Casual Friday. Hah! Here's to a good weekend minus coat and tie. Unless I go to church on Sunday. It could happen. I don't have a green coat and tie to wear tomorrow so that's not going to happen.